"It has been a very busy period for both the birds (most are now looking after small chicks and young fledglings) as well as the conservation team who’ve been out most days to survey them. Millcombe has seen the arrival of some more youngsters in the past week, namely Dunnock, Pied Wagtail and House Sparrow, and the island’s plateau is now busy with the fluttering of young Skylarks, Wheatears and Meadow Pipits. The island's Guillemots and Razorbills have all been very busy too, repeatedly heading out to sea in order to provision their adorable newly hatched chicks with a bounty of sandeels and sprat. Wednesday 13th saw the team head out to Jenny’s Cove for a dawn to dusk Puffin survey aimed at trying to identify all the burrows with pufflings in them by noting instances of feeding by parent birds. Unfortunately the last shift had to be cancelled due to the earlier-than-expected arrival of rain and strong winds, but despite this minor setback the team was able to identify at least 95 burrows which had fish delivered to them throughout the day. Additionally the productivity slope in Jenny’s Cove swarmed with birds in the late afternoon, 164 in fact, which is the highest number reported yet for this site this season." A Rose-coloured Starling on 9th was seen initially with Common Starlings near the Old Light in the morning by one of the Manx Shearwater survey team, then by Frances Stuart and Rebecca & Richard Taylor in the afternoon, when it was wheeling around Millcombe (see photos below). 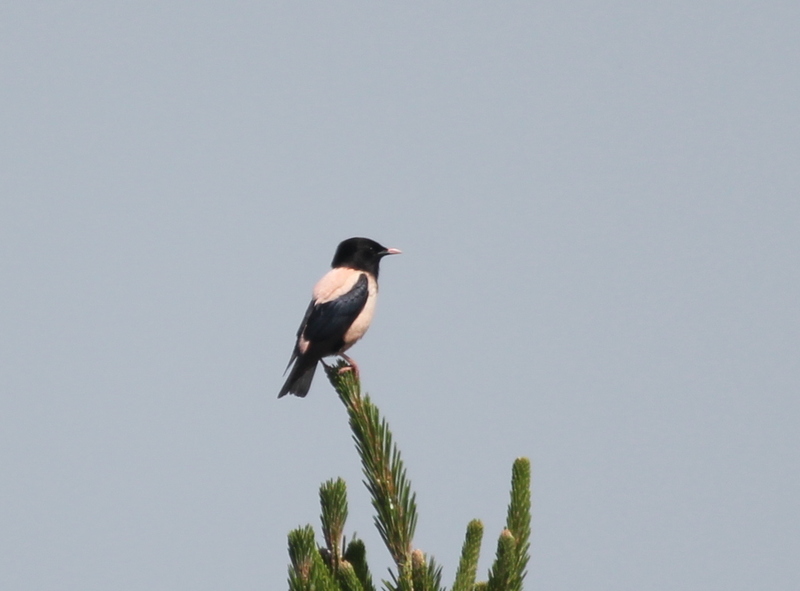 Potentially one of the birds seen on 3rd, but perhaps more likely a new arrival given the exceptional 'invasion' of this species into western Europe this summer. 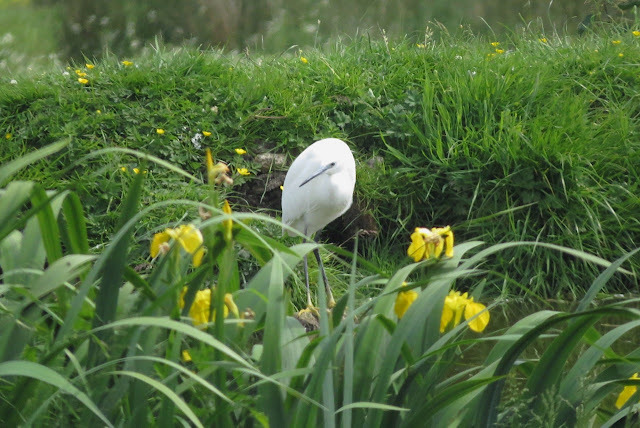 The Little Egret reported by Mark Kelly on 7th lingered around Barton Field pond until the afternoon of 8th at least. A single Dunlin was seen next to Kistvaen Pond on 9th by Andrew Cleave and his Naturetrek group. Swift: Small numbers recorded most days including two birds on 13th seemingly prospecting for a nest site on the church tower in the early morning. Our beautiful Blackbirds have now started incubating their second load of eggs for the year in Millcombe and two of the Swallow pairs are now busily feeding small young (the other is still on eggs). Spotted Flycatcher: Three on 13th. Lesser Redpoll: One flying over the High Street on 10th and one flying around Millcombe on 13th. Ringing details have come through for the colour-ringed Oystercatcher (right leg: orange ring with black digits 52; left leg: plain orange ring over metal ring) seen in Gannets’ Bay on 6th June and therefore presumed to be one of Lundy’s breeding population. 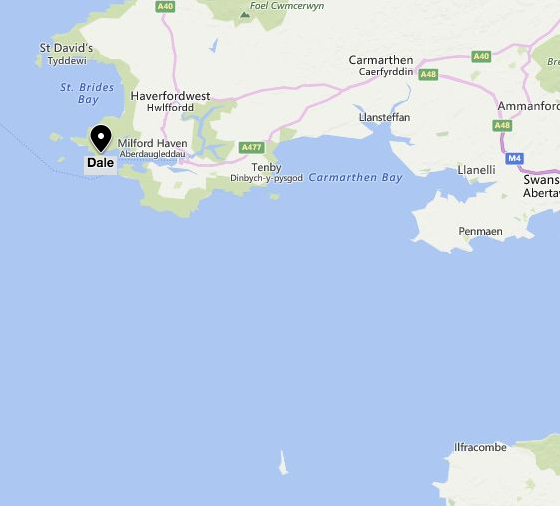 It was ringed on 17th February this year as a full adult (meaning that it was hatched in 2015 or earlier) on the Gann Estuary, Dale, Pembrokeshire. 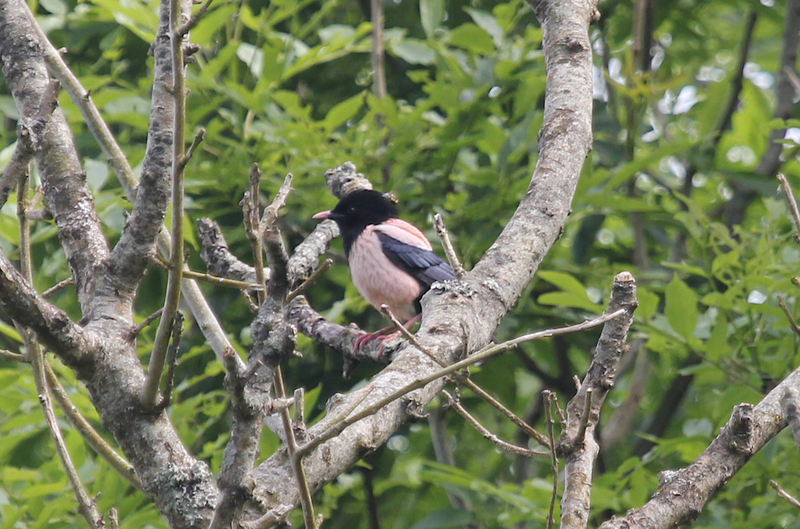 This is the first re-sighting of this individual, marked as part of a study that began in the autumn of 2015 and which has already shown that the Gann is a feeding and roosting site for many Oystercatchers that breed on Skomer and Skokholm. This is the first Oystercatcher ringing movement involving Lundy for many years and it will be fascinating to see if there are any further exchanges involving the Pembrokeshire colour-marking scheme, perhaps shedding light on where those birds that leave the island – for at least part of the winter – go to. Thanks to Paddy Jenks of Pembrokeshire Ringing Group and to Tim Frayling of Natural England for making this information available so promptly. Map showing location of Gann Est, Dale, Pembs. Mark also saw what sounded very much like an adult Roseate Tern about halfway across to the island during the morning crossing of MS Oldenburg from Ilfracombe. Other sightings during the day included 89 Puffins in Jenny's Cove, a feeding flock of 100 adult Kittiwakes off the West Side (though it seems Kittiwakes are having a very poor year breeding-wise), five Collared Doves, two Swifts heading north-east over the Tent Field, and a Whitethroat in Millcombe. The continued fine, dry weather and light, predominantly north-easterly winds have been ideal for enabling the surveys of Manx Shearwater burrows and nesting large gulls to continue apace. One of the team members found a colour-ringed Oystercatcher on 6th; it will be fascinating to see what the ringing details reveal, once available. Migration has pretty much come to an end, with just a single Swift on 5th and none at all on 6th, whilst Spotted Flycatchers were only present in ones and twos, contrasting with double digits at the start of the month. A dozen-or-so late Swallows, a singing Chiffchaff on the western sidelands at the Old Light Shearwater colony, and two House Martins heading north off North Light, provided the only evidence of ongoing movement. The Lundy 'Starling Factory' has been in full swing, with a mass fledging from nests around the village, farm and Old Light, particularly on 6th, when 22 fledglings were lined up on the Lambing Shed door. A survey a few days ago revealed 39 active nests, but as a couple of broods had already fledged, it's safe to say that this year's population was in excess of 40 breeding pairs – the highest of recent times. Two female Cuckoos were seen on 6th – one staking out Meadow Pipit nests at Quarter Wall and one at Threequarter Wall. Finally, there was a female Teal with a brood of six small ducklings on Pondsbury on 6th. During a very warm and sunny day, with just a light NE wind, the surveys of breeding Manx Shearwaters and large gulls continued, with good coverage achieved in both. Rich & Rebecca Taylor also continued their work on colour-ringed Wheatears. There was no sign of the Rose-coloured Starlings seen on 3rd (although there was no particularly thorough searching for them). A Hobby drifted north over Millcombe early in the morning, whilst a Mistle Thrush at Halfway Wall in the afternoon was probably more unusual in Lundy terms – particularly at this time of year. Also surprising was a singing Chiffchaff in Gannets' Combe! A handful of Swallows, House Martins and Swifts continued to trickle north. 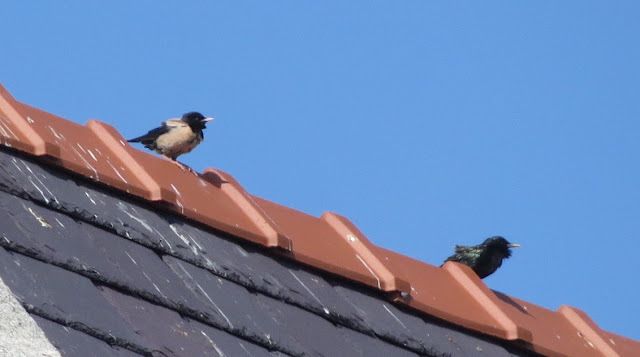 Two adult Rose-coloured Starlings (presumed m & f, as one a distinctly brighter, sharper bird) were seen at Quarter Wall gate by Tim Jones at 06.15 hrs. At 08.30 they were flying down St John's Valley and then perched on the Church before dropping down into the Tent Field, where they were still present 09.40–10.00, though by 10.00 the two birds appeared to have split up, with only the (presumed) female seen later in the day (e.g. Tilllage Field pig sty at 18.30). Other sightings included further light northbound passage of Swallows, House Martins, a Sand Martin and five Swifts. 1 Reed Warbler was along the Terrace and one Turtle Dove in Millcombe. Teams from RSPB and Natural England began all-island censuses of Manx Shearwater burrows and large gulls – Herring, Lesser Black-back, Great Black-back. Tim Davis & Tim Jones watched a ringtail Montagu's Harrier circling over North End before it headed off north and out to sea, at about 14.20 hrs. Other sightings included the male Hawfinch, male Pied Flycatcher, Reed Warbler, Turtle Dove and female Bullfinch – all still in the Millcombe area – and a stonking male Yellow Wagtail feeding around a Lundy Pony in St Helen's Field during the evening (plus the same or another heard in flight over Pondsbury). A steady northward trickle of Swallows totalled 45 by the end of the day, along with 21 House Martins and 3 Swifts. Chiffchaffs, Blackcaps and a Willow Warbler continued to sing in Millcombe and St Helen's Copse and there were at least 7 Spotted Flycatchers, including one at Puffin Slope (North End). Observations by Ann & Tony Taylor, Ivan Lakin, Tim Davis & Tim Jones. The plateau was blanketed in sea fog for much of the day, which restricted birding to the sidings and shoreline, though a clearance eventually arrived during the afternoon. Good numbers of Spotted Flycatchers were still evident with a minimum of six in Millcombe, two in St Helen's Combe and three along the West Side, but quite a few others must have been missed elsewhere. An unusually late male Pied Flycatcher was in Millcombe, along with the female Bullfinch, the Turtle Dove and the singing Reed Warbler and Willow Warbler. A Sedge Warbler also put in an appearance. Other migrants included four singing Blackcaps (two Millcombe, one St Helen's, one Hanmers Copse), four Chiffchaffs (of which three singing – two Millcombe, one at the Rocket Pole), 17 Swallows, three House Martins, two Siskins and a Redpoll. Migrant lepidoptera included Red Admirals, Painted Ladies, Silver Ys and Diamondback Moths.